Much is happening very quickly in the garden this time of year. Some of my favorite true blue flowers are in bloom. This is Veronica austriaca teucrium ‘Crater Lake Blue’ and it is a real peach of a plant if you like perennials that bloom blue, grow at a moderate pace, need moderate water and are a perfect height for the front-mid border reaching about 12-14 inches in height. The only drawback to this beaut is that it only blooms for a little more than two weeks and is then finished (meaning a nice mound of green) for the season. Try as I might to get it to rebloom in the Fall by sheering it back right after bloom, I’ve never been successful. I have V. ‘Crater Lake Blue ‘ combined with some black foliage Antirrhinum (snapdragons) that bloom a deep wine color. I am a little crazy for the combination of black foliage and blue flowering plants in the garden. The flowers of the snapdragon are just a decadent topping (like vanilla-basil ice cream on a strawberry cobbler) when they arrive. Here is another shot of ‘black and blue’ in my June garden. This is a Pacific Giant Delphinium and Ninebark Physocarpus opulifolious ‘Summer Wine’. The foliage of this shrub can look black, brown and even a coppery deep wine color depending on the light of the day. 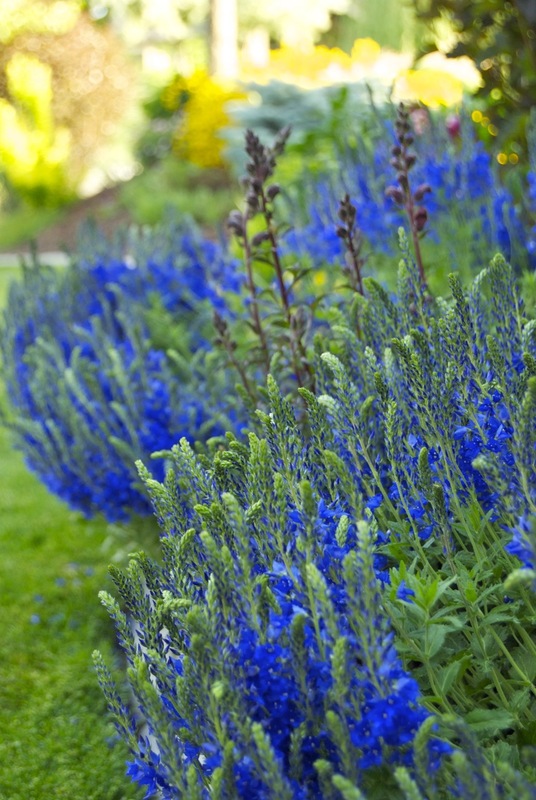 I really love delphiniums but have had a hard time growing them in previous gardens. Maybe I have finally found the right spot with this east-facing bed that is semi-protected from wind? Now a foliage favorite from the same east-facing bed. The gray artemesia stelleriana ‘Silver Brocade’ at the back of this photo is a great front border perennial ground cover. 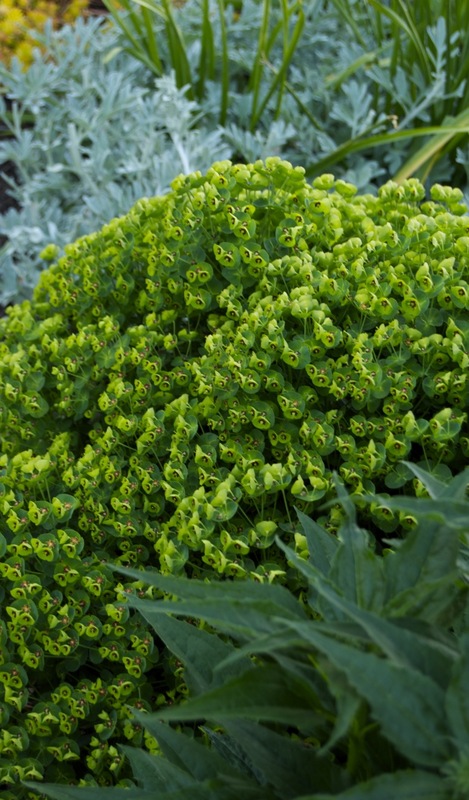 In early spring it is very pretty combined with the yellow/golden Sedum rupreste ‘Angelina’ that is seen peeking through the top left corner of the photo. But I like it today combined with perennial Euphorbia ‘Tiny Tim’ and the foliage of echinacea ‘White Swan’ that will show large white blooms with yellow/orange centers in a few weeks. What’s funny is that I didn’t plan this combination, I just needed a place to put the euphorbia and decided to stick it here. It’s very happy and I like it with these companions. An unplanned success! A gardener needs those now and again to balance out the planned uh…shall we say mishaps! 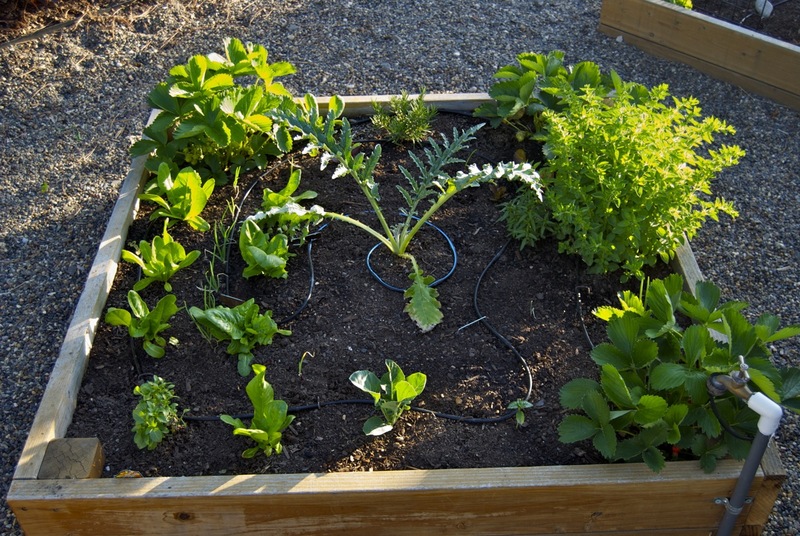 This is the smallest bed and it contains strawberries, onions, lettuce, herbs and an artichoke. I’ve harvested a few strawberries so far and cut some lettuce and rosemary. Oh, I also have a cauliflower planted and this is my first try growing this veggie. Here is a photo showing the entire alley and the closest bed is the first one I planted this Spring. 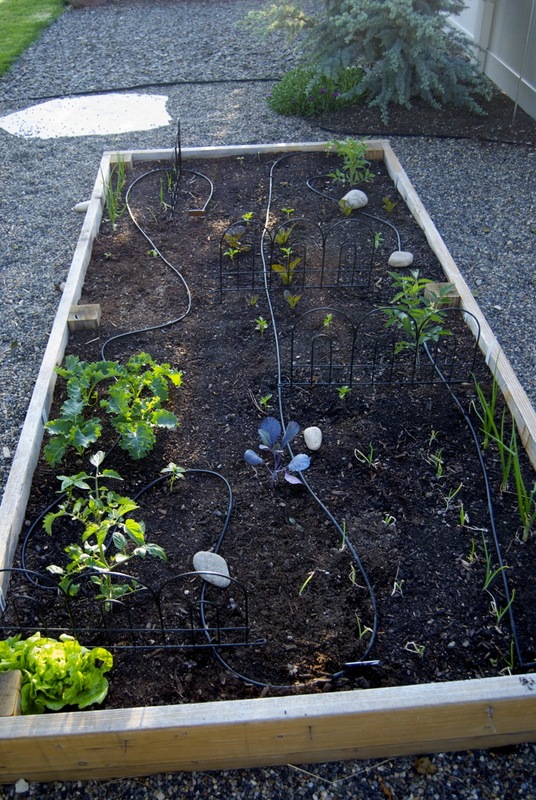 It holds beets, arrugula, kale, lettuces, peas, carrots, garlic, onions, broccoli, a cabbage and calendula flowers. I’ve been harvesting lettuce, arugula and beet foliage for a few weeks. The last bed I planted (just after the 15th of May) contains tomatoes ‘Juliet’, ‘San Marzano’, and ‘Navidad’ along with basil, peppers, lettuce, carrots, onions, kale, cabbage, and a new-to-me variety of snapdragon from Baker Creek Heirloom Seeds that has black foliage. 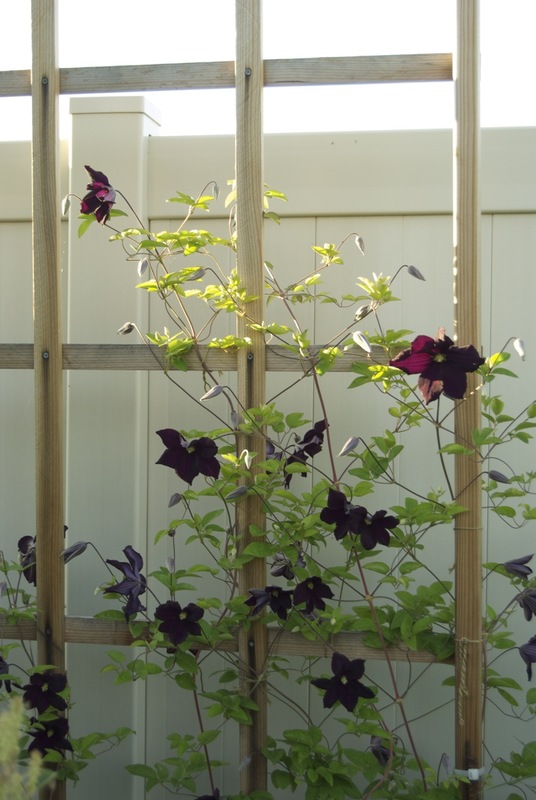 My last favorite to show is a new clematis, ‘Romantika’ that is blooming on the trellis the ‘wonder builder’, a.k.a. my husband, built last fall. The blooms are very dark plum reminding me of a yummy Port wine somehow. Maybe this is a sign I should plant some grapes! How about you? 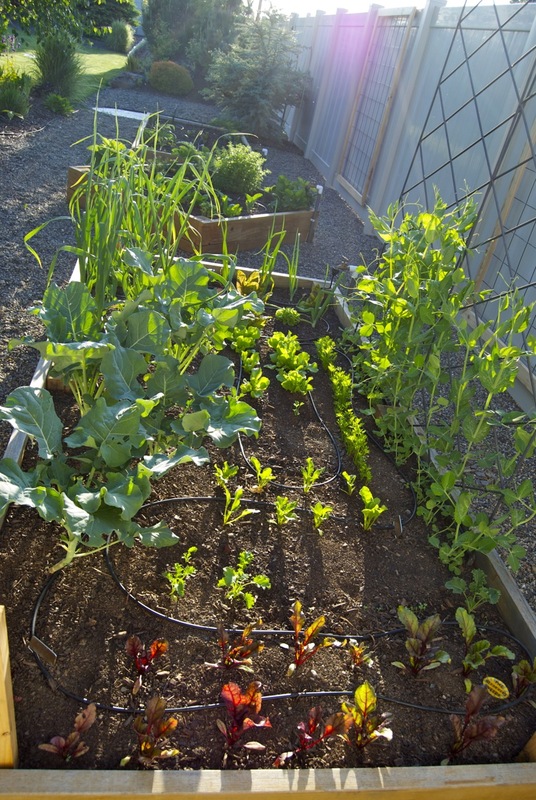 How is your June garden starting off and what are your favorites? Do you have color or foliage combinations you get a little ‘crazy’ over? Do share! 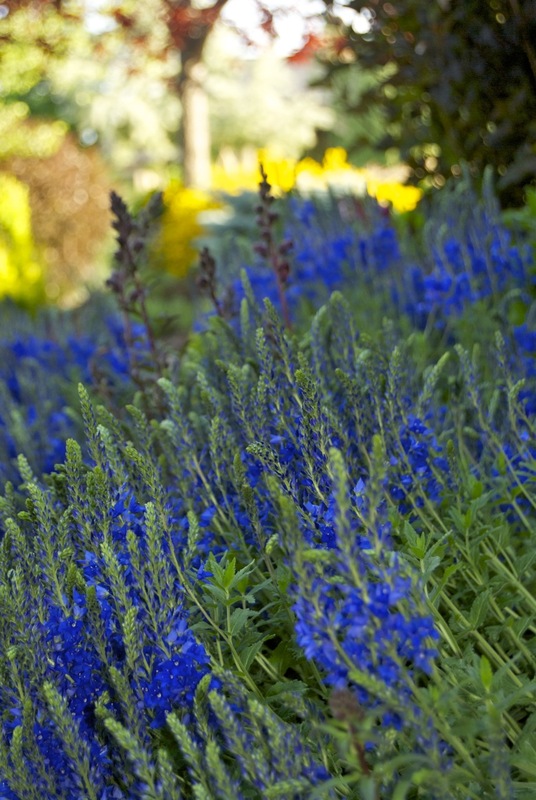 I love those blues with the dark purples…and what a gorgeous veg garden area. If my host service for my blog can figure out their problem, my blog will show what is happening in our garden…lots of weeds, cool weather and rain right now. I love your unplanned foliage combo – beautigful! Funny that, how sometimes the unplanned works so well. The silver artemisia and the euphorbia look lovely together. In fact everything is looking good and healthy! Especially your edible alley! 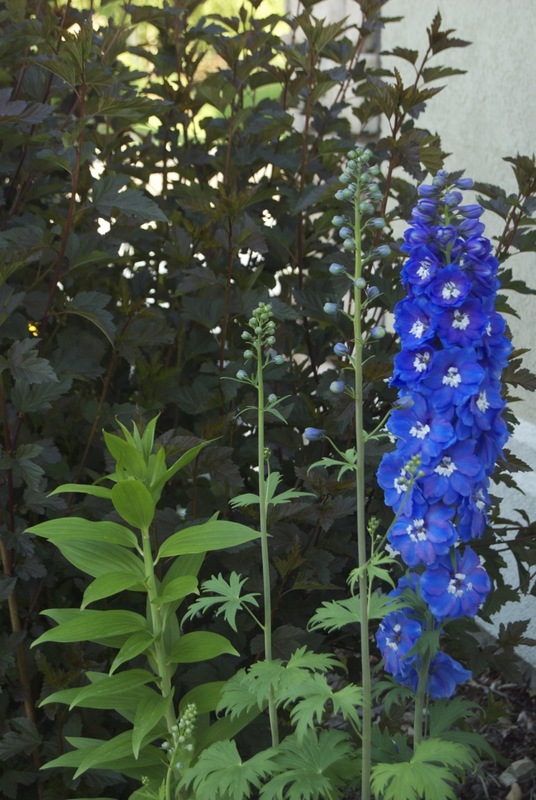 Dazzling array of delights, especially the giant pacific delphiniums! Hmmm…the only way I can take pink is against a bronze or darker background. Now I am tempted to try that with some blues. Thanks for the tip. Your garden is so beautiful! Blue flowers are my favorites. We were just in Washington (to meet our new granddaughter), and we visited Lakewold Gardens Estate, in Tacoma, while we were there. Their Blue Poppies were unbelievable. I wish they grew in Colorado!